With bee populations in decline, a new study offers hope for a relatively simple mechanism to promote bee health and well-being: providing bees access to sunflowers. The study, conducted by researchers at North Carolina State University and the University of Massachusetts Amherst, showed that two different species of bees fed a diet of sunflower pollen had dramatically lower rates of infection by specific pathogens. Bumble bees on the sunflower diet also had generally better colony health than bees fed on diets of other flower pollens. The study showed that sunflower pollen reduced infection by a particular pathogen (Crithidia bombi) in bumble bees (Bombus impatiens). Sunflower pollen also protected European honey bees (Apis mellifera) from a different pathogen (Nosema ceranae). These pathogens have been implicated in slowing bee colony growth rates and increasing bee death. The study also showed a deleterious effect, however, as honey bees on the sunflower diet had mortality rates roughly equivalent to honey bees not fed a pollen diet and four times higher than honey bees fed buckwheat pollen. This mortality effect was not observed in bumble bees. Jonathan Giacomini, a Ph.D. student in applied ecology at NC State and corresponding author of a paper describing the research, said that bees already seem adept at collecting sunflower pollen. 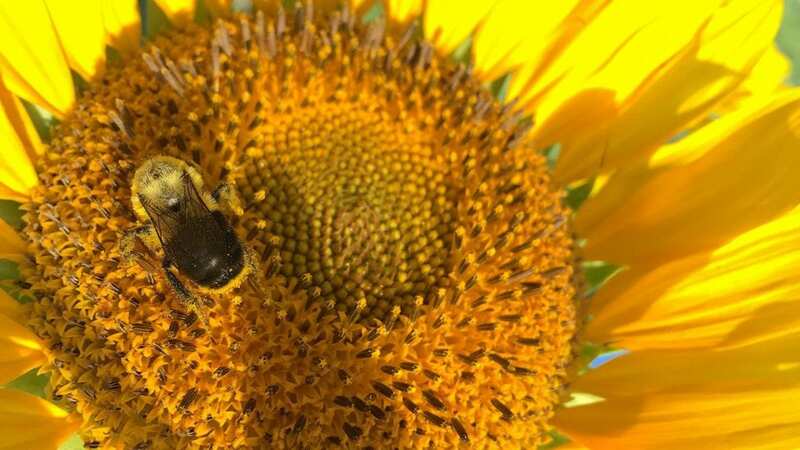 Annually, some two million acres in the United States and 10 million acres in Europe are devoted to sunflowers, he said, making sunflower pollen a ready and relevant bee food. "We've tried other monofloral pollens, or pollens coming from one flower, but we seem to have hit the jackpot with sunflower pollen," said co-senior author Rebecca Irwin, a professor of applied ecology at NC State. "None of the others we've studied have had this consistent positive effect on bumble bee health." Sunflower pollen is low in protein and some amino acids, so it should not be considered as a standalone meal for bee populations, Irwin said. "But sunflower could be a good addition to a diverse wildflower population for bees," she said, especially generalists like bumble bees and honey bees. The NC State researchers are now planning to follow up on the study to examine whether other species of bees show the positive effects of sunflower pollen and to gauge the mechanism behind the mostly positive effects of sunflower pollen. "We don't know if sunflower pollen is helping the host bees fight off pathogens or if sunflower pollen does something to the pathogens," Irwin said. Future research is aimed at figuring this out. Co-lead author Lynn S. Adler, Jessica Leslie and Evan C. Palmer-Young from the University of Massachusetts Amherst co-authored the paper, as did NC State's David Tarpy. The study was funded by the U.S. Department of Agriculture (grants USDA-AFRI 2013-02536 and USDA/CSREES MAS000411), the National Science Foundation (grants NSF-DEB-1258096/1638866, REU supplement NSF DEB-1415507), the N.C. Agricultural Foundation, and NC State. Abstract: Global declines in pollinators, including bees, can have major consequences for ecosystem services. Bees are dominant pollinators, making it imperative to mitigate declines. Pathogens are strongly implicated in the decline of native and honey bees. Diet affects bee immune responses, suggesting the potential for floral resources to provide natural resistance to pathogens. We discovered that sunflower (Helianthus annuus) pollen dramatically and consistently reduced a protozoan pathogen (Crithidia bombi) infection in bumble bees (Bombus impatiens) and also reduced a microsporidian pathogen (Nosema ceranae) of the European honey bee (Apis mellifera), indicating the potential for broad antiparasitic effects. In a field survey, bumble bees from farms with more sunflower area had lower Crithidia infection rates. Given consistent effects of sunflower in reducing pathogens, planting sunflower in agroecosystems and native habitat may provide a simple solution to reduce disease and improve the health of economically and ecologically important pollinators.